A partial solar eclipse will be visible throughout the Bay Area on Thursday afternoon, given clear skies. The Bay Area is one of the best places in the U.S. to view this eclipse. Here, the moon will cover about 40 percent of the sun. As you move south and east across the country, smaller and smaller segments of the sun will be eclipsed. 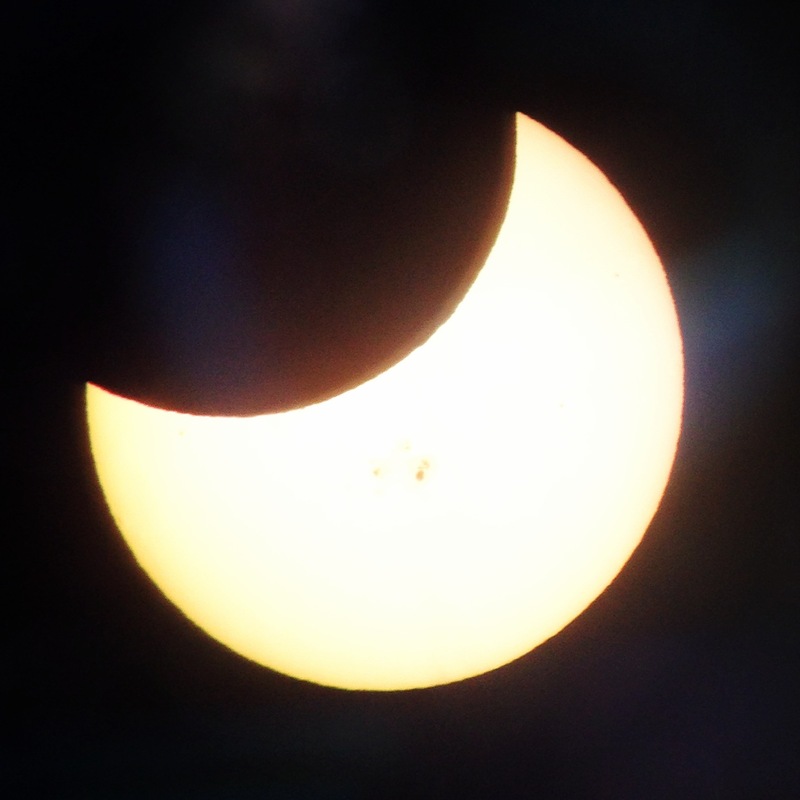 Solar eclipses occur when the moon moves between Earth and the sun. Picture the orbit of the moon and the orbit of Earth as two huge hula hoops in the sky. 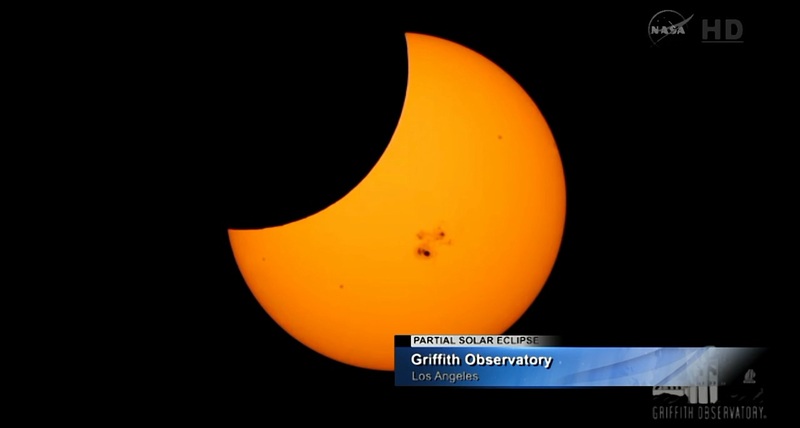 "The only time you can have eclipses is when the two hula hoops cross, when the two orbits cross," says Andrew Fraknoi, chair of the Astronomy Department at Foothill College. "And that's what happens every six months. The orbit of the moon and the apparent orbit of the sun cross." Fraknoi says today's solar eclipse won't reduce the amount of light we see outside, which raises a question: how can the moon cover up 40 percent of our sun without us noticing it? "The short answer," Fraknoi says, "is that the sun is brighter than you think." He says if you were shopping for a light bulb the same wattage as the sun, forget your typical 40 watt bulb: You'd have to buy a 400,000,000,000,000,000,000,000,000 watt bulb. That amount of light so overwhelms the light receptors in the human eye, Fraknoi says, that even losing nearly half of it doesn't change our overall sense of light and dark. If you want to watch today's event, there are a number of ways to do that safely. And you don't even have to wake up in the middle of the night like you may have done for the lunar eclipse two weeks ago. The eclipse will begin at 1:52 p.m., as the moon begins to creep across the sun. The moon reaches peak eclipse at 3:15, so the best viewing time is between 3 and 3:30 this afternoon. But don't imagine you can look at the sun just because it's partially covered up -- you'll burn your retina if you look directly at a solar eclipse, just the way you burned fall leaves as a kid, using a magnifying glass in the sun. And sunglasses are not enough. To look directly at a solar eclipse, you need a special viewer, available for sale at many science centers. 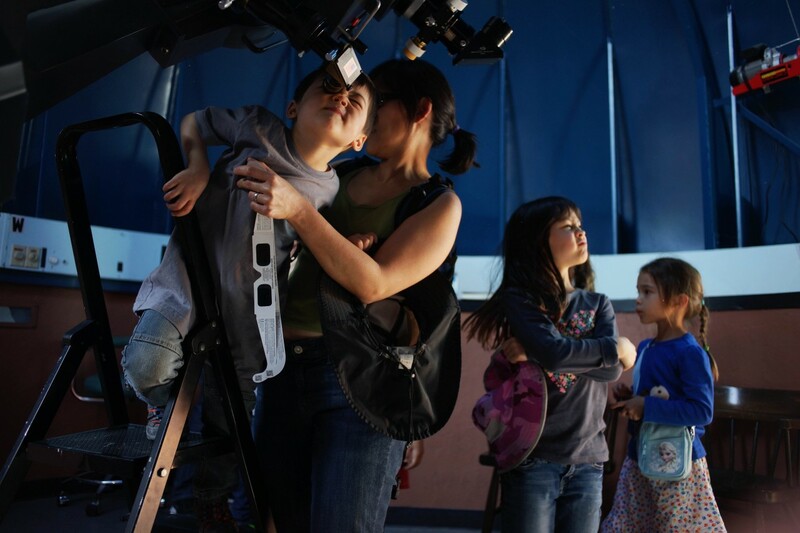 Science museums and observatories around the Bay Area are holding eclipse viewing parties, listed below, where you can safely watch the eclipse through filtered telescopes. "If you can get to where you can see the sun either projected from a telescope or through a telescope with a safe filter," Fraknoi says, "you can actually see the seething surface of our star, the sun, and then the dark body of our much closer moon, covering up some part of the sun." 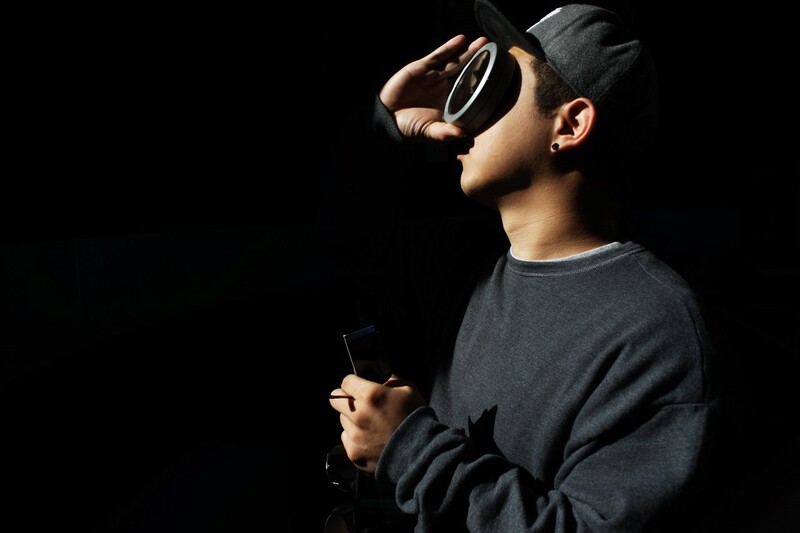 You can also have a lot of fun watching the eclipse by making your own pinhole projector. Even more basic than that, you can create a pinhole projector with your hands by simply overlapping the fingers of one hand on top of the other - creating a waffle pattern - and allowing the sun to pass through the holes between your fingers and make a projection on the ground. Or if you're in area with trees, look for the projected images of the sun on the ground as it passes through the spaces between the leaves. Today's solar event is the last in our eclipse season this year. The next event will be a lunar eclipse in April. 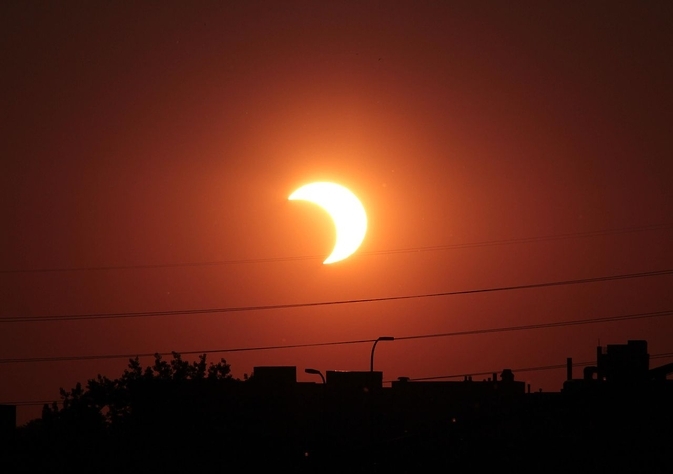 The next solar eclipse won't happen until August 2017. The California Academy of Sciences and Morrison Planetarium will host a viewing from 1:30 to 4:30 p.m. on their living roof (weather permitting), with planetarium staff on hand. Rain or shine, the eclipse will also be broadcast via internet feed inside the museum. Museum admission fees apply. 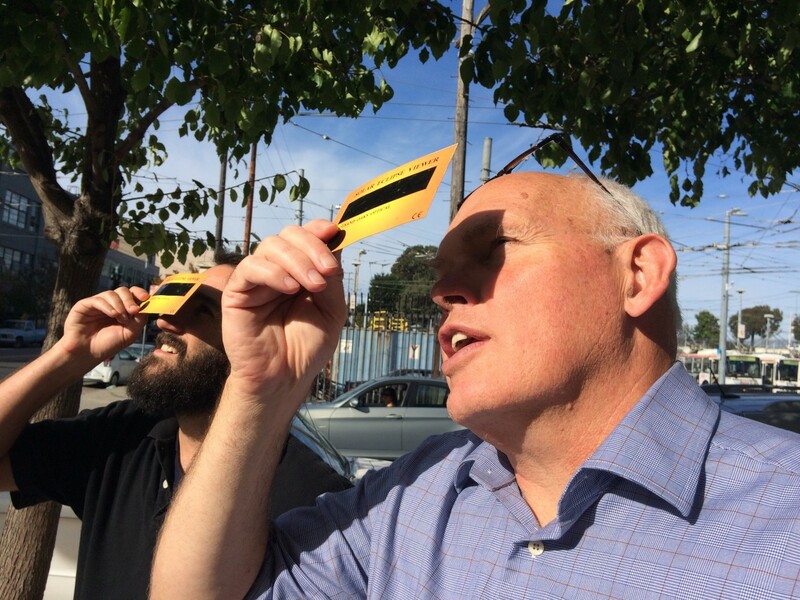 San Francisco State University faculty and students will offer eclipse viewing in the plaza at the south entrance to Thornton Hall, from 1:52 to 4:32 in the afternoon. 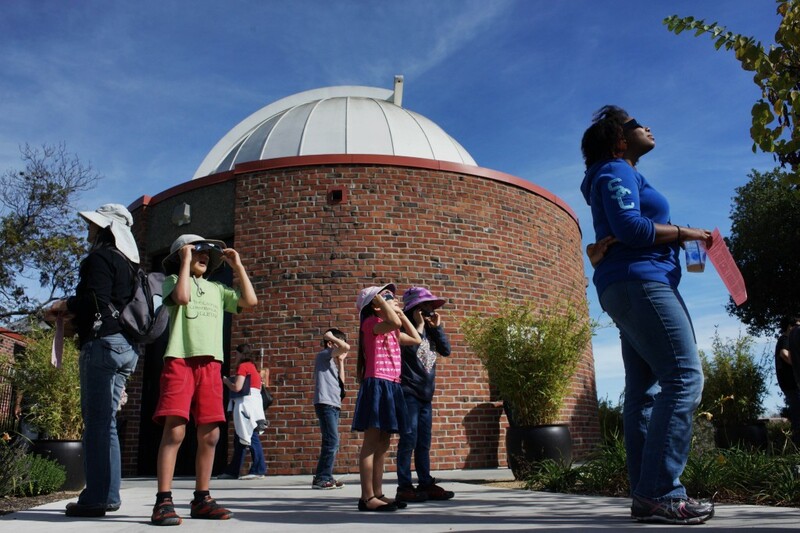 The Lawrence Hall of Science is hosting an event for museum guests from 1:30 to 4:30 p.m. that includes observations through solar telescopes, a Q&A in the planetarium, and model demonstrations. Eclipse-viewing glasses are also available for purchase in the store. The Chabot Space & Science Center will have astronomy experts and special eclipse viewers on the observation deck to help people view the eclipse safely. Included with museum admission or $15 for the viewing party only. The Children's Natural History Museum in Fremont will have telescopes for viewing the eclipse from 2 to 4:00 in the afternooon. In case of rain or clouds, the museum will also have a video feed of the eclipse inside the museum, along with solar system demonstrations. The Mt. Diablo Astronomical Society will host an eclipse viewing party from 2 to 4:30 p.m. at Lindsay Wildlife Museum in Walnut Creek. Foothill College Observatory will be open from 2 to 4:30 for an eclipse party. Parking costs $3. College of San Mateo Observatory will have several solar telescopes available in the observatory from 1:45 to 4:30 p.m., including one that people can use to take pictures of the eclipse. Members of the San Mateo County Astronomical Society will provide telescopes, viewing aids and information from 2 to 5 p.m. at the San Carlos Library. The many perforations in the library dome will also cast beautiful images of the eclipsed sun. The San Jose Astronomical Association will hold an eclipse party for the public from 1 to 4 p.m. at Houge Park. Sonoma State University is hosting a public viewing from 1:45 to 4:30 p.m. at the campus observatory and a track and field nearby. The Robert Ferguson Observatory will be open from 1 to 4:30 p.m. for observing the eclipse. Parking is $8. Thanks to Professor Andrew Fraknoi, Foothill College, for this list of eclipse viewing parties.